Facebook wants to be your source for everything — whether or not you’re actually on Facebook. Today at F8, Facebook introduced the ability to embed Facebook videos on other websites. While you’ve been able to upload your videos to Facebook for ages, embedding them anywhere else was a bit of a pain. You could tear through the video player’s source code and try to get something working — but in most cases, it was easier to just turn to YouTube . Now you just click the “embed” button and get a blurp of code, much like what you’d expect to see in any of the myriad video hosting sites. 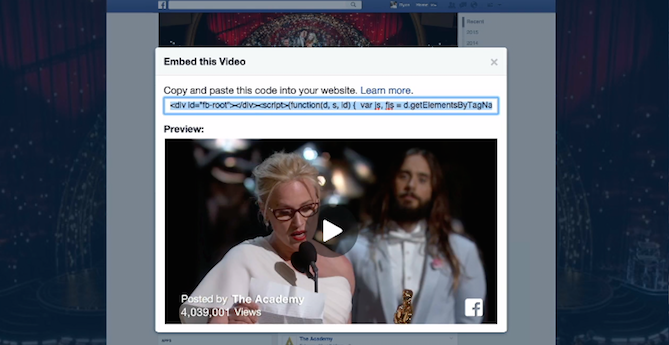 Paste that code into your blog, and the Facebook-hosted video should pop right up. It’s a small, but clever move. Want to upload something to Facebook, but also want it on your blog? Generally, that meant uploading it once to Facebook, and once to something like YouTube. Now, you’ll only need Facebook — and Facebook will be the one getting those oh-so-important video views.